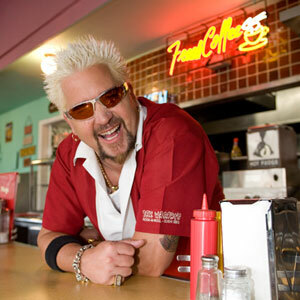 This is the second installment of my review of a few of the Diners, Drive Ins & Dives locations that I have had the chance to visit. This set of reviews includes another location from Florida (where I live), Georgia and Buffalo, NY. The app that I have been using to locate all of the "Triple D" sites is created by MapMuse, and it offers great information on each restaurant, directions, photos, and a way to "check off" the locations that you've visited. You can also "favorite" some of the ones you've visited to keep track of the very special places you'd like to visit again. If you have a smart phone--you definitely need to download this app so that as you travel, you can always find a great "Triple D" location to visit. Matthews Cafeteria is a family owned business that was started in 1955 in Tucker, GA a suburb of Atlanta that is just a "stones throw" from Stone Mountain. As you can see from the photo to the right, Matthews is truly a cafeteria in every sense of the word. 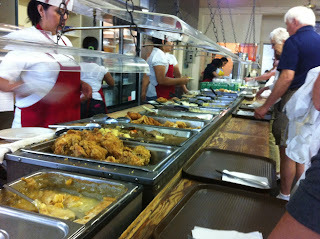 Patrons grab a tray and move through the cafeteria line, free to pile any of the items on to their plates. Matthews unfairly places the desserts at the front of the line---the cobbler is delicious, but the pecan pie is simply outstanding. Matthews is straight up Southern cuisine at it's best. The fried chicken is done to perfection, the meatloaf is awesome and the greens are delicious. I sampled some of each off of the plates of my friends and family, but chose the turkey and stuffing served with gravy and mashed potatoes along with some table green beans that had to be cooked with a pound of bacon. The atmosphere at Matthews is pure Americana---it feels as though you step back in time when you walk into Matthews, and in a good way. I give Matthews 4 out of 5 stars. 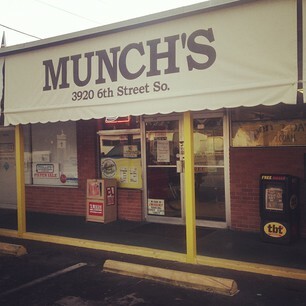 Munch's opened as a sundries store (convenience store) in 1952 in the growing suburbs of St. Petersburg. Over time it developed into a grill and a restaurant serving breakfast and lunch. The neighborhood around Munch's has changed a great deal since it opened, but the restaurant still maintains the essence of what it was originally built to do--provide a great place for customers to get an awesome meal, a friendly greeting and to get a feel for what life used to be like before the world got so busy. The signature dish that was on "Triple D" was the chipped beef, but when I went to Munch's my extremely awesome waitress recommended that I try Edna's Breakfast: A huge fresh-baked biscuit cut in half and topped with a slice of ham, all of which is topped by sausage gravy and two eggs done to order (I had sunny side up) and accompanied by fresh hash browns. It was a good choice. Munch's may not look like much, but if you find your way there, you won't regret it. I give Munch's 3 and half out of 5 stars. The Lake Effect Diner is one of the last dining car-style diners left in America, and has been restored beautifully. If you have no idea what "lake effect" is---you've never lived in one of the Great Lakes states during the winter. The featured dish on "Triple D" was the homemade ham, but when my family (pictured right nearly 3 years ago) visited we went another direction. I had the BBQ Meatloaf Bomber sandwich, which was slow cooked homemade meatloaf, topped with cheddar cheese, caramelized onion and the House BBQ sauce. My wife had the Souvlaki Salad with chicken, and my son had the Beef on Weck, a sandwich with top round of beef, slow roasted and served with au jus and horseradish. Of course we had to sample some of the Buffalo wings with some bleu cheese to dip them in. The atmosphere was awesome---pure 1950's America. I give the Lake Effect 3 out of 5 stars.